Graduates will earn at least R 4.7 million more in their lifetime versus those without a degree. (MoneyWeb 12 July 2013). According to Kentse Radeb, individuals who enter the job market without a degree can expect to earn on average of almost R197 436 less a year, compared with their peers with a degree. This adds up to a total of R4.7 million less over a total working life. This is a strong argument for those with Bachelors exemption to do everything in their power to complete a degree. Recognising the need in the market place for employees with a degree, and the insufficient provision of places to study a degree, Boston City Campus & Business College was the first Unisa licensee, and has partnered with UNISA for the past 21 years offering students the opportunity to register for certain UNISA degrees through Boston. This partnership has been extremely successful and continues to produce excellent results with some Boston classes recording a 100% pass rate for their Unisa examinations. Panagopoulos attributes this success to the fact that students, while studying correspondence are still able to attend lectures which are presented by highly qualified lecturers. This means that they are not left completely to their own devices when it comes to completing their UNISA degrees. Classes are also much smaller than at mainstream universities, so for those students who prefer a smaller classroom environment where they can get more individual attention, working towards a degree in this way is a more attractive option. ‘Our lecturers are all experts and work in their fields. This means they are able to bring unique and practical examples into the classroom,’ explains Panagopoulos. 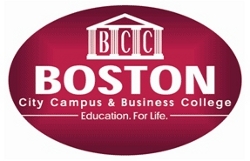 Lectures are currently available for BCom, BCompt and LLB students at Boston’s Bedfordview Campus. Boston Campus uses mixed modes of education to ensure students can fit the tuition into their day whether they are working, full-time students or running a family. Some classes are offered on a lecture basis, others may be via Technology Based Training (TBT) where the lectures have been pre-recorded on specific modules. This TBT method is offered at all branches and the advantages are numerous: students are able to access material at any time, they can work at their own pace skipping sections they are confident in or repeating areas they do not understand. Boston is also able to monitor how often students access video material so that they can keep an eye on a student’s progress. “Bedfordview is the only branch that currently offers a combination of live lectures and TBT for the UNISA courses mentioned, says Panagopoulos”. Students do not have to register with Boston for all of their modules – they may register for the subjects they need extra help with. “We recommend Full-time students register for all their modules with the campus to ensure success in all their exams, however working students have limited time available” says Panagopoulos. A great advantage for students is that lecturers are available to give one-on-one assistance either in person, using email or over the telephone. Panagopoulos points out that Boston also offers fast track revision courses which anyone can attend. At these courses lecturers highlight important points, go through past papers and discuss exam technique in order to ensure that students are well prepared for their exams. Lectures can be done full time or part time depending on the individual’s situation – whether they are working or have other commitments.